No Competition! is an offsite programme of artist projects that explored the relationship between art and non-competitive sport. Three new commissions by Paul Farrington, Charlie Murphy and Ian Whittlesea launched individually over the programme’s three month duration to coincide with celebrations leading up to the London 2012 Olympics as part of Go Kingston 2012. 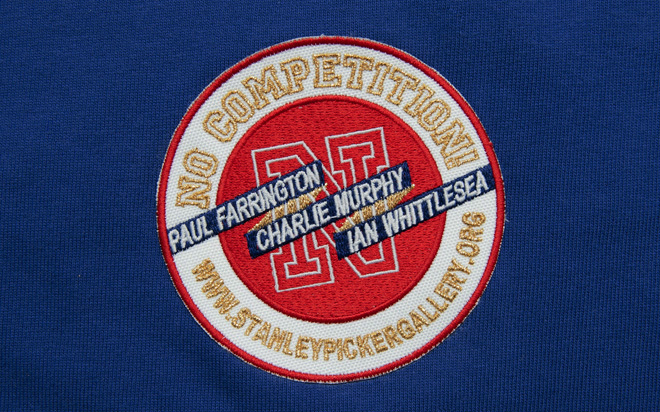 The programme was staged at various locations in Kingston, central London and online whilst the the Stanley Picker Gallery was closed for refurbishments (May-Sept 2012). No Competition! commenced with a series of new cultural walking-trails developed by designer Paul Farrington as part of a Royal Borough of Kingston initiative – funded by the Mayor of London’s Outer London Fund and Design for London – to create new ways for pedestrians to discover and enjoy Kingston town centre. Research for the project was informed by the history of Surrey Walking Club, Victorian photographer Eadweard Muybridge, the sporting pursuits of Orienteering and Pedestrianism – popular in the late 1800s – and interviews with local residents. For No Competition! Farrington designed the Kingston Navigation Wheel, a special cardboard disc that visitors can use to explore alternative routes around the town, discover individual and collective histories, and newly observe the details that make up their everyday surroundings. For her Kingston Big Wheel, artist Charlie Murphy recruited local gymnasts, dancers and athletes to form a spectacular chain of human locomotion presented as a special live performance for the International Youth Arts Festival 2012. Incorporating a series of choreographed movements inspired by the iconic motion-sequence imagery of Kingston-born Victorian photographer Eadweard Muybridge, the piece responded to formal public displays, dance spectaculars and protest traditions. An accompanying new digital video work, celebrating the stroboscopic qualities of this epic athletic endeavour was shown at Kingston Museum accompanying the exhibition Olympic Celebration: Athletes in Motion. In Ian Whittlesea’s film commission for No Competition! identical twins Helen and Kathryn Cartwright are seen demonstrating the Ju-no-Kata, a choreographed pattern of judo movement. The film references artist and judo devotee Yves Klein’s Les Fondements du Judo (The Foundations of Judo), published in 1954 and translated into English by Whittlesea in 2009. Whittlesea’s second project for No Competition! relates to the exercises that Swiss artist and teacher Johannes Itten taught his students at the Bauhaus. Itten was a devout Mazdaznan and derived these exercises from the book Mazdaznan Health & Breath Culture by Dr. Otoman Zar-Adusht Ha’nish. Whittlesea produced a newly illustrated and annotated edition of this book, published in collaboration with Open Editions, London, together with a set of posters depicting Kingston University Art & Design Foundation Course students performing the original Mazdaznan exercises, seen here. Paul Farrington leads Studio Tonne, whose eclectic portfolio has included interactive screen-based solutions for Moby and Depeche Mode, print work for the RCA and large scale installations for Imperial College London. Trained as a graphic designer at the RCA, Paul works in the spaces between art, illustration, identity, publication, website, music, soundtoys, exhibition and public space design. His work has been shown at events and festivals such as Mutek (Canada), Transmediale (Berlin), Lovebytes (UK), Sonar (Spain), Ars Electronica (Vienna), Sintensi (Naples), Domus Academy (Milan), Experimenta (Lisbon) and the Kulturhuset (Stockholm). Charlie Murphy graduated in Fine Art (Photography) from the RCA in 1999 and works across a wide range of media including photography, video, performance, sculpture and light installations. Often making work in response to specific sites and opportunities, her art has engaged an eclectic range of subjects and communities including dentistry, trout tickling, cartwheeling and country dancing. She has exhibited throughout the UK and internationally, including presentations for the Wellcome Collection (2011), Tate Modern (2007), the Edinburgh Festival (2006) and the Venice Biennale (2005). Ian Whittlesea‘s work is often concerned with words, and with the lives and work of other artists and writers. It assumes many forms: from painstaking text paintings that take years to make, to ephemeral posters and transient projections. In 2003 he began to learn judo and translated Yves Klein’s 1954 book Les Fondements du Judointo English. This generated a series of related events and ephemera, including recreations of Klein’s Judo AcadÃ©mie de Paris at Tate Modern (2009) and Cokkie Snoei Gallery, Rotterdam (2009). He has exhibited throughout the UK and internationally, including at Payne Shurvell Gallery, London (2011), The Narrows, Melbourne (2010) and The Chelsea Space, London (2009), and is represented by Marlborough Contemporary, London.